Every Spring for over 30 years students from across the region have gathered in our halls buzzing with excitement in anticipation of performing at our Secondary School and Children’s Festivals. The Secondary School Festival featuring students in grades 7-12, is just around the corner in March. But close behind is the Emily Jordan Children’s Festival in May, featuring students in grades 3-6. Having performed once and attended once as a “groundling” at the Secondary School Festival in my youth, I can assure you that the memories built here last a lifetime! The glorious experience of performing at the Folger as a teenager felt like such an honor. I won’t even get into bragging about my troupe being recognized with the coveted Brian Cabe Award…but I digress. The purpose of these festivals is to celebrate Shakespeare in an atmosphere that is fun, relaxed and supportive. For the students, performing the works of the Bard on the Folger’s Elizabethan Stage is exhilarating. But before the exhilaration comes preparation and often times frustration. As the teacher/director one has to battle with what play to choose, editing the script, getting the students to understand the text and of course staging the play. Not to mention expression, costumes, props, etcetera, etcetera! In particular the first task of choosing a play for performance with Elementary students can seem daunting. One may worry about content, but this can be easily solved with clever editing, which we at Folger Education fully support. After all, we may never really know exactly how Shakespeare’s plays were originally edited. With that great advice, let the festivals begin! Capturing Macbeth film trailer takes you inside the critically-acclaimed production. Directing Macbeth demonstrates the process that Aaron Posner and Teller go through to mount the stage production. Mr. and Mrs. Macbeth takes a close look at what motivates these complex characters by interviews with the actors and directors. Acting Macbeth gives fascinating insight into how actors prepare for their roles. Comedy in Macbeth illustrates how the tension in the play is often relieved by humor, with a special focus on the role of the Porter. Blood Will Have Blood gives a behind-the-scenes look at how stage blood is used to create a “horror show” atmosphere in Macbeth. Stage Combat explains how the fight director coaches the actors to create a unique fighting style and believable battle sequences. You can even read the transcripts of each of these on our site. 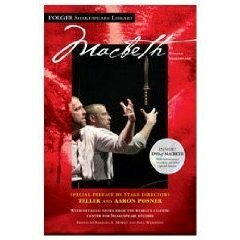 So we’d like to learn what you early adopters of the DVD think about it and more importantly, we’d like you to tell us how you might use the play and the Special Features in teaching Macbeth. Try to be as specific as you can. We’re really curious how you might teach the play if every one of your students had the book WITH the DVD. It’s been quite a week in the District as we’ve been met with a wave of snowfall unlike we’ve seen in … well… ever! Besides closing most of the area for a week, the snow also caused us to cancel a few of our opening week performances of ORESTES in the Theatre, which resumed performances Thursday night. Theatre certainly has come a long way since its origins in Ancient Greece, but its influence lives on. ORESTES is one of many Greek tragedies that survives the centuries through translation and performance and sometimes translative adaptation. Anne Washburn’s take on the tragedy about the surviving children of Agamemmnon and Clytemnaestra shows us that a centuries-old play still entertains and educates audiences today. Shakespeare’s plays, too, have a certain je ne sais quoi which allows them to stay present in the public eye, and even Shakespeare may have been influenced by Greek Tragedy. Take, for example, HAMLET and ORESTES: They both involve the murder of a king by a relative. The protagonists find themselves denied their fathers’thrones by newly wedded couples. Both Orestes and Hamlet experience periods of madness, and their revenge takes the lives of both the mother and her new husband. Also, both stories place great emphasis on the importance of faithful friendship (in Plyades and Horatio) vs. seeming friendship (in Rosencrantz and Guildenstern, and Menelaus). The primary difference is the end. Orestes follows the convention of the day using adeus ex machina to conjure a happy ending, while Hamletends tragically with almost everyone dying in the final scene. You can find more information like this in our Study Guide for ORESTES, playing at the Folger until March 7. Do any other plays stick out to you as influenced or similar to a Greek play? In 2008, Folger Shakespeare Library’s Education Division held another of its Teaching Shakespeare Institutes for secondary school teachers. Among the applications we received was one from Harvey Sadis, an elementary school teacher who lived in Seattle, Washington. Because the grant was focused secondary school teachers, we did not offer a seat to Harvey. Upon hearing the news that he did not get a spot in the Institute, Harvey wrote me a strongly worded email. My initial response to Harvey was that we had more than a sufficient number of secondary school teachers to fill the Institute, but had there been a scarcity of participants his application would have been strongly considered. He wrote back that I was missing the point. “Elementary school teachers are teaching Shakespeare,” Harvey noted in another email. In fact, Folger Education’s Shakespeare Steps Out program, which we offer to schools in DC and surrounding communities, encourages teachers in grades 3-6 to teach the Bard’s work. Therefore, why weren’t we considering offering an institute for elementary school teachers? So began an email correspondence between the two of us over the next few months. In the fall of 2008, Folger Education began to explore the possibility of developing a two-day conference for elementary school educators. With the help of our Development Office, we were able to secure funding to host a two-day conference in June 0f 2009. We invited Harvey, among other educators with experience working with elementary school teachers and our Elementary Education Program Coordinator, to participate in developing the conference. We made 30 spaces available for the conference at a modest fee of $25. And guess what happened? All of the spaces were filled, and filled by teachers from DC, Virginia, Maryland, New Jersey, and Texas! Teachers were eager for the chance to learn more about teaching Shakespeare through performance and ready to share what they had been doing, often alone, in their classrooms and schools. Folger Education’s Elementary Shakespeare website is an outgrowth of that conference, of Harvey’s strongly worded email back in the spring of 2008. We invite you to read what Harvey has to say about teaching Shakespeare in the elementary school classroom, to use his lesson plan on Macbeth, and the lesson plans of several other teachers we’ve added to the page. Most of all, we invite you to send us your lesson plans for possible inclusion on the site. Send them to educate@folger.edu. In a future blog, I’ll link to a template to use when preparing lesson plans. And don’t forget to visit our Shakespeare for Kids page. It’s filled with activities your youngsters will enjoy! Stay tuned! A recent article in the New York Times about people who travel the world to see all of Shakespeare’s plays in performance reminded me of the New York Shakespeare Festival’s late 1980s and into the 1990s cycle of all of Shakespeare’s plays. Proposed by Joe Papp in 1987 and set to be completed in six years, it was an ambitious undertaking that actually took longer than six years to complete. Still, it gave people in the New York metropolitan area the opportunity to see all of the plays without having to leave the country. And it was a bargain, just four hundred 1987 dollars, exactly the amount of the raise I got as a teacher of English that year after a 30-day strike against the school district where I was working. For me, it was a good way to justify having walked the picket line for a month. Every time I sat in my seat at the Public Theater or at the Delacorte in Central Park I was reminded of what it took to make it possible to see all of the Bard’s work live on stage. As I read the article, I felt a kinship with the people mentioned in it. While they traveled the globe in search of Shakespeare, I journeyed on NJ Transit and the NYC subway to see the plays. What is it that makes people want to do this? To stop at nothing to see the plays? I can’t really explain it, except to say that once I committed to seeing the canon in performance, I didn’t miss a performance, even when it meant getting dropped off at the entrance of Central Park and hobbling the quarter mile or so to the theater on crutches after breaking my knee. And that was to see King John! Imagine what I would have gone through to see Titus Andronicus! If you’ve been on a quest to see it all, where have you journeyed? What challenges have you had to overcome to see a particular play? And, has it been worth it? For me, absolutely. I even have the official “I’ve Seen It All” tee-shirt given out at the end of the last play in the series.